Here is a Happy Birthday Chocolate Pizza made just for them. 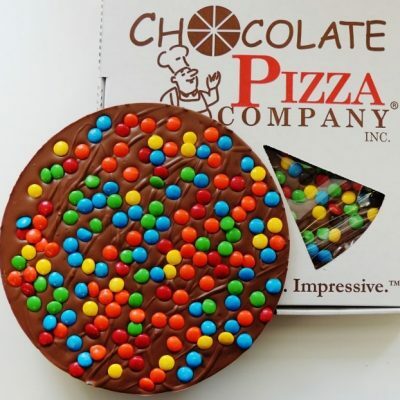 We will personalize this Chocolate Pizza to make the day just that much more special. So go ahead, say it in chocolate, “Happy Birthday Mom” … “Happy Birthday Christie” … “Happy Birthday Bear” … “Happy Birthday Connor” – they’ll love opening this surprise and finding that it was handmade just for them. 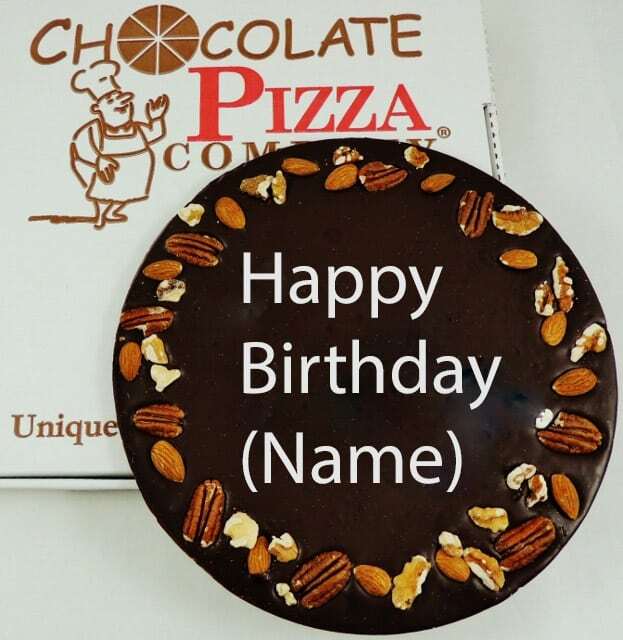 Chocolate Pizza blends rich milk or dark chocolate with homemade English toffee and surrounds it with the border of your choice (colorful chocolate candy or pecans, almonds, walnuts) with your personalized birthday wishes scripted in white chocolate. Sealed in cellophane and served in a custom pizza box this is a gourmet chocolate gift they will remember. To add to the surprise, include our famous Peanut Butter Wings. 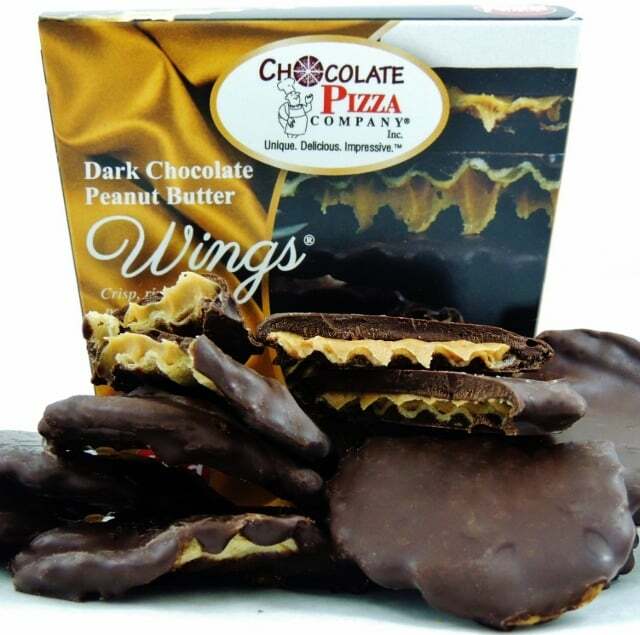 Crisp, rippled potato chips covered in creamy peanut butter and dipped in milk or dark chocolate for a taste masterpiece they will rave about. 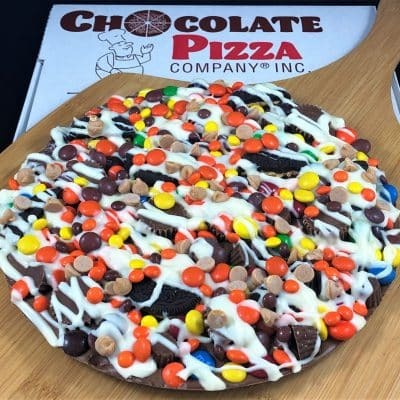 What (NAME) on the Chocolate Pizza? Who are the birthday wishes for? Custom Chocolate Pizza birthday wishes add a personal touch to this gourmet chocolate birthday gift. Birthdays are special and sending a custom Chocolate Pizza elevates the surprise because it reminds the person that this gift was made just for them. Talk about feeling special. Featured on CNBC, Hallmark Channel, CMT, Food Network and NBC among other major media, Chocolate Pizza Company has been America’s gold standard of Chocolate Pizza for nearly 3 decades. Our talented team of chocolatiers create this unique confection by blending the highest quality Swiss-style chocolate with homemade English toffee and then hand-decorating each one so every Chocolate Pizza is unique. We start by carefully tempering the chocolate, a very precise process of manipulating the temperature of melted chocolate to give it strength, shine and a velvety, melt-in-your-mouth feel. All gourmet chocolate is tempered which distinguishes it from ordinary compound chocolate found in most mass produced chocolate candy. The difference in quality is one you taste with every bite. We make our English toffee in-house and in small batches so that we know it is fresh and at peak flavor when we blend it with our chocolate. The recipe is a local one that dates back to the early 1900’s and adds both texture and taste to our Chocolate Pizza. While we make some Chocolate Pizzas without the toffee, it is a signature component in the majority of our famous confection. When we’re making toffee, the entire facility carries that wonderful aroma as each batch bubbles away before being spread on baking sheets to cool and then chopped into fine pieces. 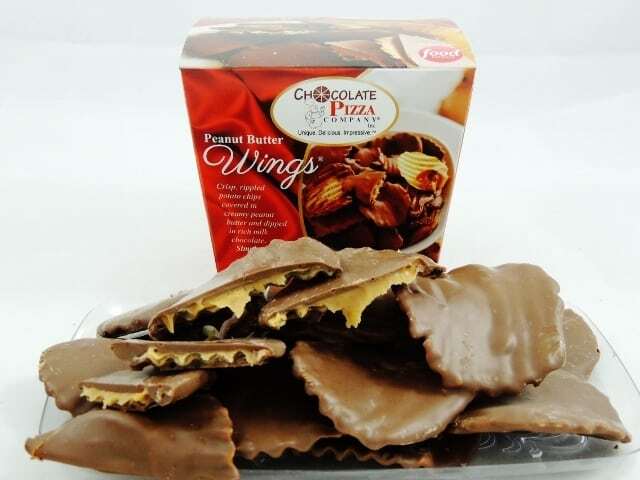 We pour the chocolate and toffee blend into genuine pizza pans and top them with a dizzying variety of nuts and candies. For Chocolate Pizzas that convey a message like for birthdays, holidays, anniversaries or special occasions, we script the words or design by hand using white chocolate. 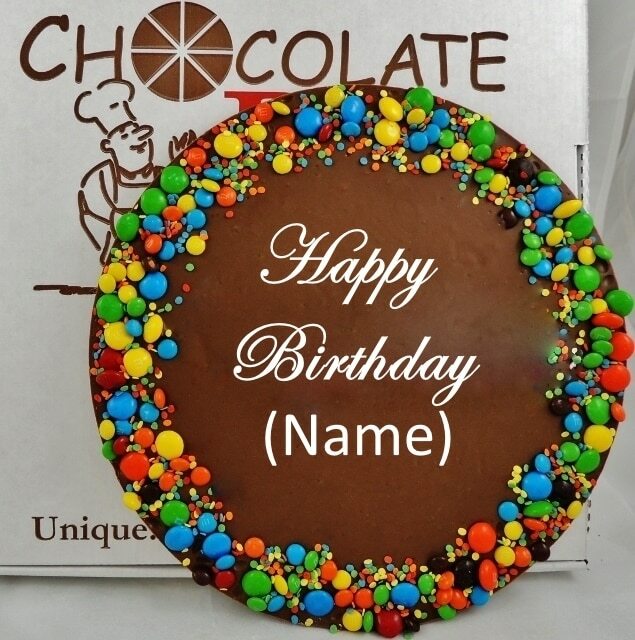 Custom Chocolate Pizza birthday wishes are a specialty as we can add a name to your Happy Birthday Chocolate Pizza. It takes a lot of skill to do that but it also means each Chocolate Pizza is absolutely unique. 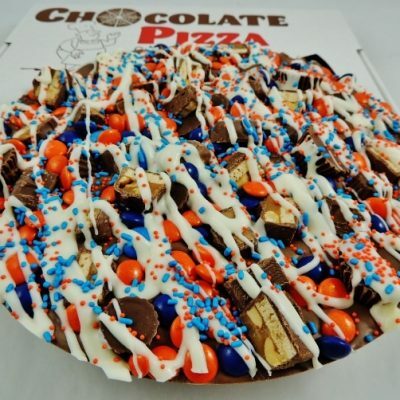 Each Chocolate Pizza is presented in an actual pizza box. The box offers a viewing wedge on the top that gives a hint of the special treat locked inside. The specially designed box holds the Chocolate Pizza firmly from the corners while letting it ride on a cushion of foam. This design allows us to ship our Chocolate Pizzas nationwide and indeed worldwide by virtually eliminating breakage in transit. Once your Chocolate Pizza arrives, store it out of direct sunlight and in a cool, room temperature location. No need to refrigerate or freeze it. Our Chocolate Pizzas are happiest at temperatures between 55-70 degrees (F). Above 75 degrees chocolate melts easily so avoid over-handling the product or exposing it to a warm environment. Properly stored, your Chocolate Pizza will be fresh for up to 9 months. There may be impostors out there but Chocolate Pizza Company makes the only trademarked Chocolate Pizza in America. Family-owned and operated, we are proud to make a gourmet chocolate gift that is unique, delicious and impressive. Enjoy!